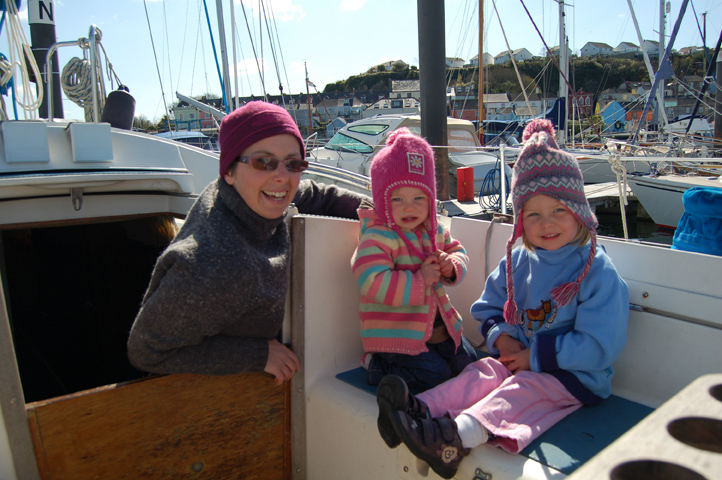 "We’re living this amazing aboard life with children"
Martina Tyrrell live aboard her boat Carina of Devon with her husband and their two daughters. 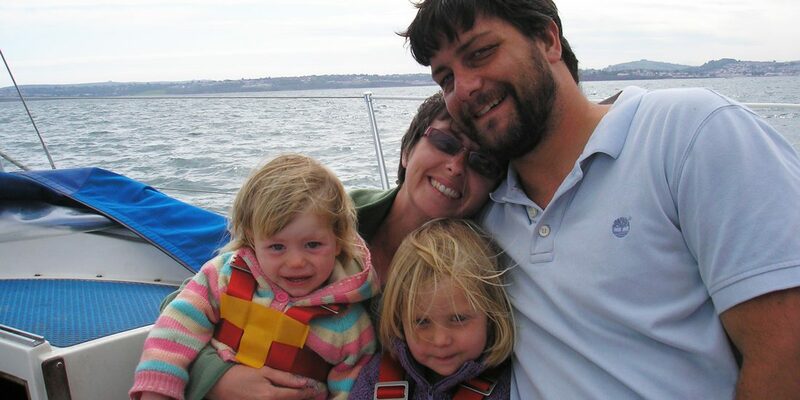 Martina tells their adventures, observations of life, her (and sometimes Julian’s) thoughts about culture, nature, home schooling, parenting and life in general, in a beautiful blog, Carina of Devon, Adventures of a family afloat. 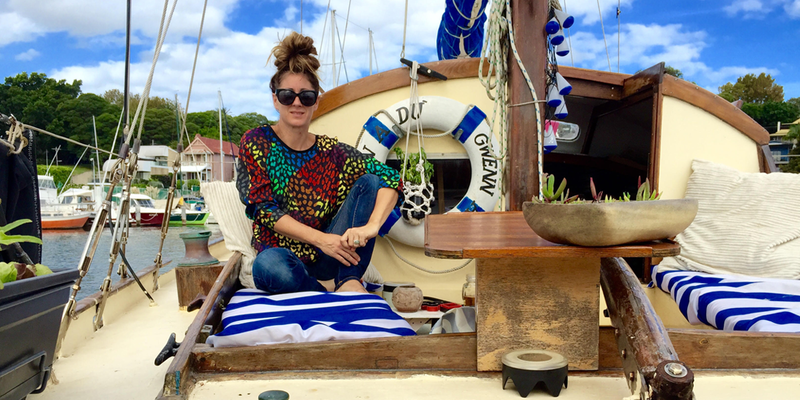 We met her, to learn how a family lives on a 36-foot boat! First of all, please introduce you and your family. My name is Martina and I come from Ireland. I grew up far from the sea, in the middle of the Bog of Allen. 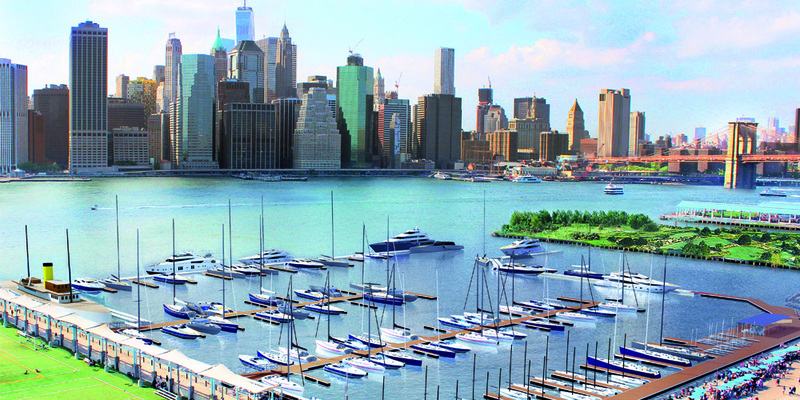 By my mid-twenties my entire sea-faring experience consisted of two ferry trips to the UK and back. Despite that, or maybe because of it, in my early teens I developed a fascination for the sea that has never left me. I’m an anthropologist and my research focuses specifically in indigenous knowledge of the sea. I’m married to Julian, a geophysicist who hails from Warwick in the very heart of England. He grew up sailing dinghies on the River Avon and later occasionally sailing charter yachts with his dad. Until I met Julian in 2004 I had never sailed, but from my first day aboard a yacht I was hooked. We have two daughters. Lily is 6 and Katie is 5. 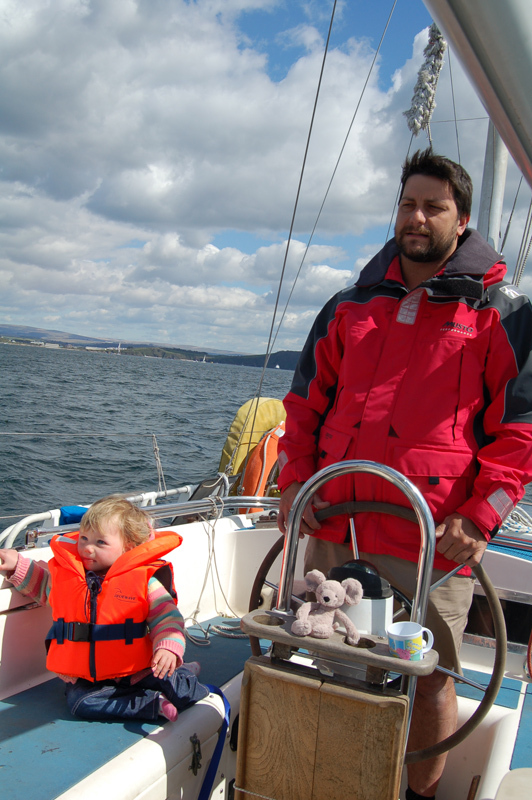 Lily first sailed when she was nine weeks old. She loves reading and wildlife and helping to inflate the dinghy and jumping onto pontoons to tie up the painter. Katie loves dancing, doing cartwheels and playing with Lego. She hates eating her dinner. They both love climbing the rigging and playing with the other sailing kids we meet on our travels. In 2011 you and Julian decided to quit your jobs, sell your house and buy a boat to live on. Why? In April 2011 we suddenly thought there’s no guarantee that we’ll have more money in twenty years time, or that we’ll still both be alive and healthy. So we decided to make our dream a reality there and then. Six months later we had sold our house and about 90% of our belongings, bought our boat, and were well on our way to making our dream a reality. We still have very little money, but we make do, and we’re now living this amazing live aboard life with our children. What kind of boat is Carina of Devon? 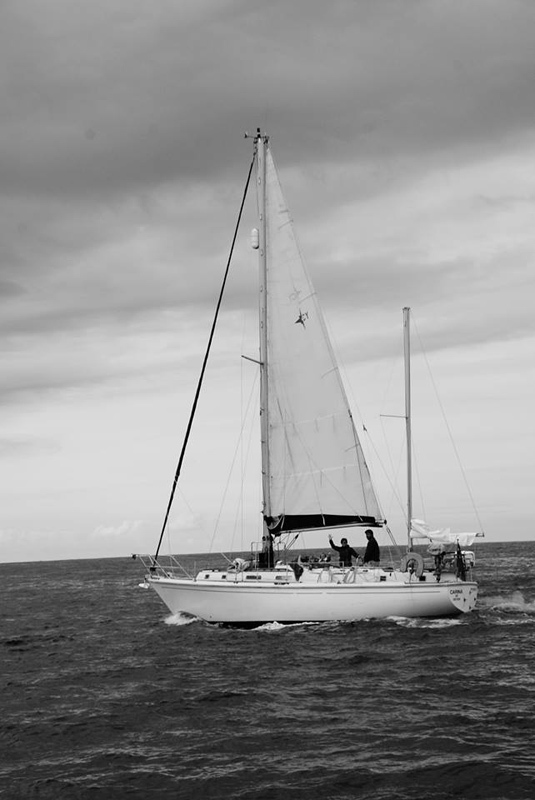 Carina is a 36-foot Westerly Conway ketch. She has a semi-long keel, a deep centre cockpit, and at 11 feet wide is beamy for her length. She was built in 1979 and has had two previous owners. 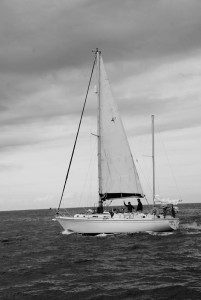 Her last owner lived aboard in the Mediterranean and sailed her to the Caribbean in 2010/11. As soon as he sailed her back to the UK he put her up for sale. In the four years we’ve owned her we’ve replaced the engine, the heating system and the standing rigging. We’ve made no internal modifications and Julian’s list of repair and maintenance jobs seems to get longer and longer all the time! 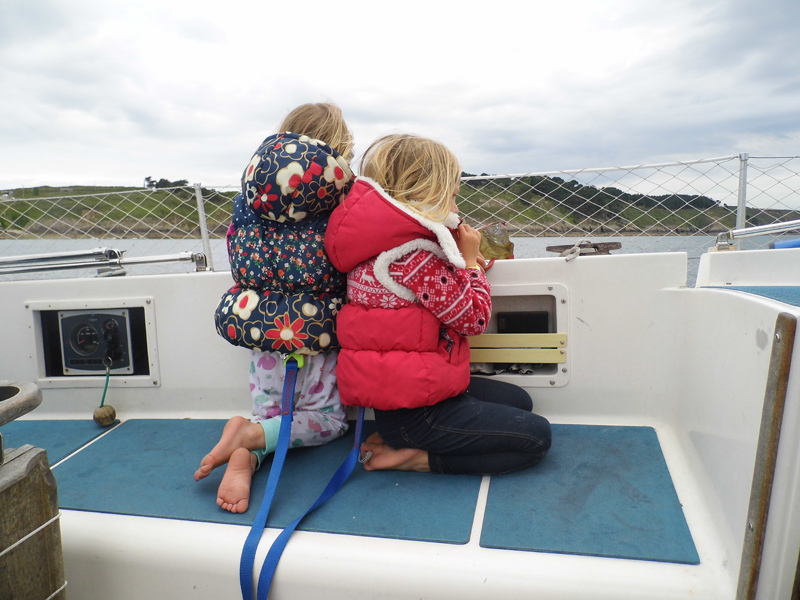 You have two little girls: how is the family life on a boat? In one word – messy! Life is getting easier as the girls grow older. At first there were nappies and the quarter berth was packed with their back carriers that we used to carry them about everywhere. They had to be lifted into and out of the dinghy, onto the pontoon, even into bed, because their berth was too high for them to climb into. As they have grown all those things have gradually faded away and physically life is easier. Just like little girls anywhere, they love to play. Their bedroom is the v-berth, where they have all their toys, books and clothes. They love to play in there, but they also love to dress up in their fairy princess costumes and play with their teddies and dolls on deck. They like to arrange their teddies and Barbies on the masts and booms, which in the past has caused people to stop and take photos of our curiously festooned boat! We don’t have a television, but we have a well-stocked library of DVDs that they like to watch. We like to do craft activities and the saloon is regularly decorated with paintings and mobiles. Up until now they’ve been home educated, so we try to squeeze in some educational activities – reading, writing, maths – at some point every day or so. All the other educational stuff just falls into place through the life we live – history, culture, language, meteorology, biology, geography, astronomy are part and parcel of our everyday lives. We’ve decided to remain anchored in Spain for this winter, so recently they’ve started to attend school in a little village on the Rio Guadiana, so they will be immersed in Spanish language and culture. We spend a lot of time off the boat. The girls love walking, so we go on long rambles in forests and hills, and spend a great deal of time on beaches. When we’re in towns and cities we go exploring historical and cultural sites. Obviously with a family of four, cooking, laundry and all the day-to-day chores take up quite a bit of time. But living the life we do, time is something we have in abundance. We try to involve the girls in those tasks as much as possible. Hand washing the laundry on deck can be lots of fun! In the past three years you’ve cruised in England, Ireland, France, Spain, Portugal and Morocco. Which are the places that you loved the most? I have two favourite places. I come from Ireland, so it was my dream to cruise the southwest of Ireland, to places that I knew well from the land, but had never been to by sea. It was magical. 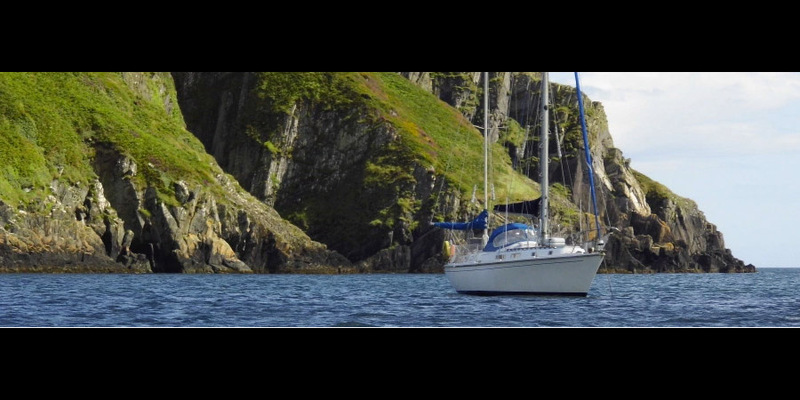 From Kinsale we sailed west, along coastline that grew more rugged and spectacular the farther west we went. We saw dolphins, seals and basking sharks and a profusion of sea birds. Long Island and Horseshoe Bay on Sherkin Island, both in Roaringwater Bay were memorable for their stark quiet beauty. Derrynane was the scene of many great family holidays when I was young and to anchor there with my own family was a dream come true. The huge bays, Kenmare and Bantry in particular, were a joy to sail across and up. My other favourite place was Galicia in northwest Spain, where we cruised the rias in summer 2014. Galician culture, food and architecture are all amazing and the people are so friendly. There are great beaches, great forest walks, and great museums and churches to visit. We attended fiestas in almost every town we visited – some religious, but most celebrating local seafood – molluscs, octopus and barnacles! Are you planning to cross the Atlantic? We would love to cross the Atlantic some day. Indeed, we dream of taking the Panama Canal to the cruising grounds of the Pacific. 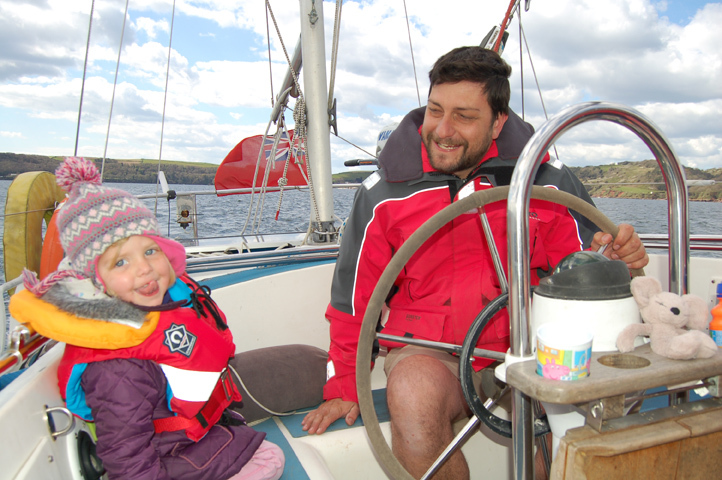 But that sort of sailing requires some additions to Carina – such as wind vane steering – to make blue water cruising with young children a little easier, and more financial resources than we currently have. Finally, a question that we always do: what does it means for you “sail”? I am still a very inexperienced sailor and we seldom cover the same ground twice. So sailing for me is venturing into the unknown, both geographically and in terms of my knowledge and skill. 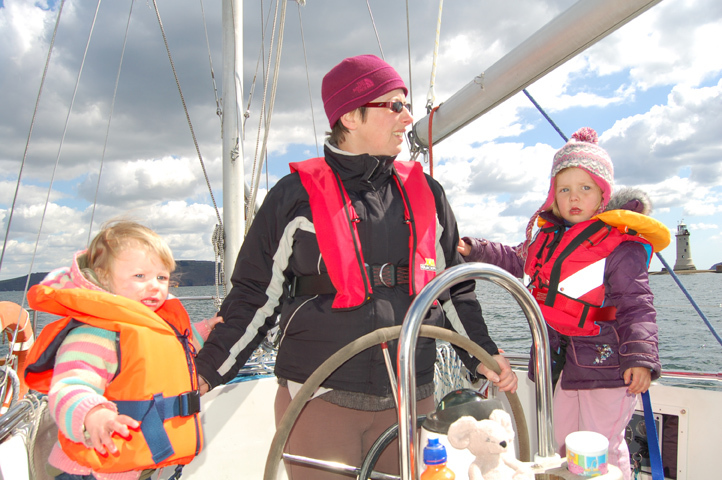 Every time we set sail we develop our sailing and navigation skills and we develop our understanding of weather and tides and currents. Sailing for me is the absence of human sights or sounds, the sea and sky and maybe a far distant shore, dolphins and sea birds appearing suddenly. 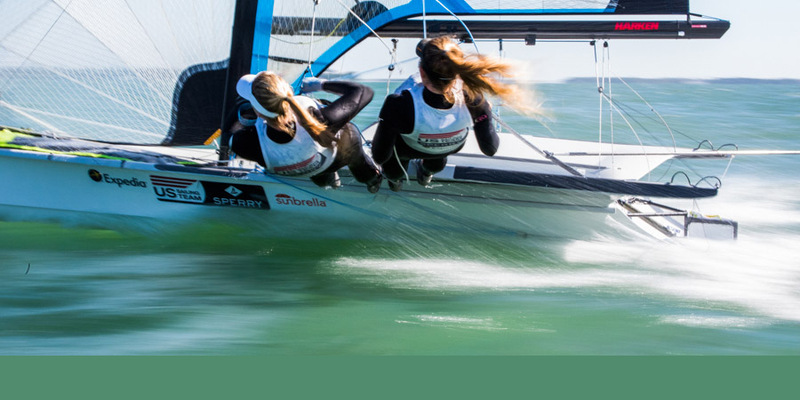 Sailing is being in the elements – sun, rain, wind. Sailing is being alone at the helm at night, the huge starry sky overhead, bioluminescence on the water, the occasional puff of dolphins exhaling alongside. Sailing is singing songs in the cockpit, drinking cuppa-soup and eating crisps and flapjacks. Sailing is crusty salt-sprayed hair and greased-up salty glasses, sunburn and windburn. Sailing is the anticipation of the adventures that await us at our next destination. YOU CAN FOLLOW MARTINA AND HER FAMILY HERE!